Our Custom Head-Shells are a great way to match a cabinet order, or simply create a stunning head-shell to feature your prized amp. Custom options such as inlay work, stain matching, and configuration layouts. Our goal is to work as closely as possible with the player in order to create the head-shell of their dreams. The ordering process offers 3 options for fitting. 1. Preferred - Send us your head and when the project is done we'll send it back to you ready to go, along with your old head-shell (if you choose). 2. 2nd Best - Send us your head, and we'll blue print the measurements we need and then send your original head back to you. When the shell is complete it will be sent to you and you assemble it. 3. Lease preferred - We'll tell you what numbers we need and you provide us with the measurements as precisely as possible, as well as photos. While this is clearly the easiest route for the player, we cannot guarantee a perfect fit because you are providing the numbers. If you're very comfortable with a ruler and have one that measures in 32nds this can work for you. 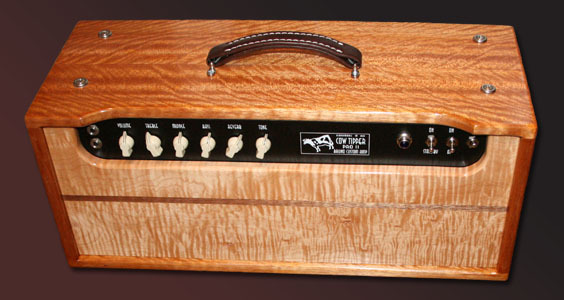 We also are able to fit certain brands and model amps standard that we have done before.